Popular third-party Twitter client Tweetbot is the latest app to be updated with support for the 3D Touch feature on the new iPhone 6s and 6s Plus, and it now supports both Quick Actions on the Home screen and Peek and Pop gestures within the app itself. A hard press on the Tweetbot icon on the Home screen brings up options to create a new tweet, tweet a photo, and view the Activity Tab that was recently added in the fourth version of the app. When a notification is present, there's also an option to reply to a tweet or a direct message from the Home screen Quick Action list. Peek gestures, which bring up previews of links, work with embedded tweets, Safari website links, Twitter profiles, and more. A Peek gesture can be initiated in Tweetbot with a hard press, and pressing even harder expands into a Pop gesture, allowing content to be opened from the Peek. The 3D Touch features in 4.0.1 Tweetbot are available only on the iPhone 6s and the 6s Plus, the two devices that support 3D Touch. Other users will not notice any changes in the app, aside from additional language localization in French, Spanish, and Japanese. - 3D touch peek and pop support in the timeline. We'll add it to more places in future releases. 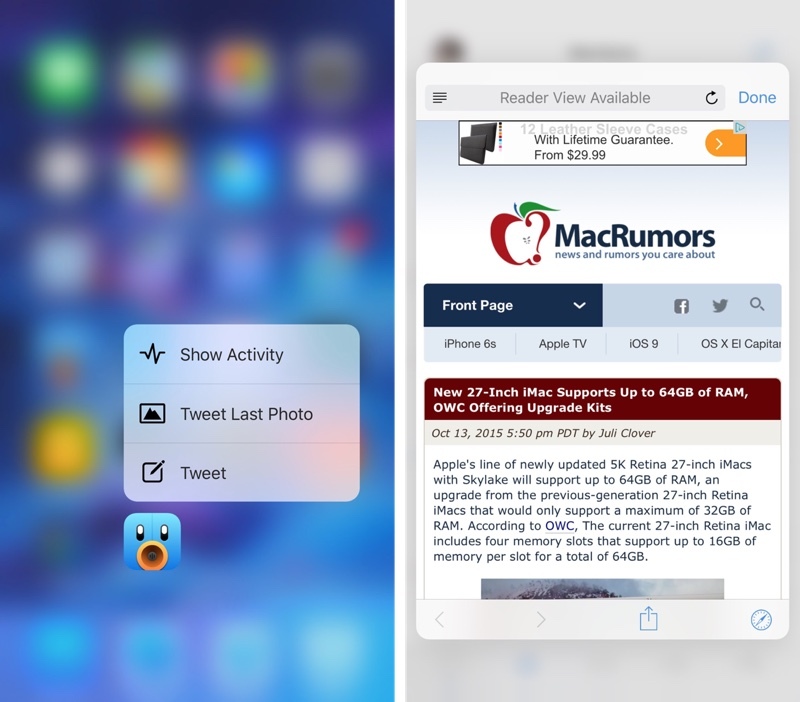 - 3D touch home screen quick actions. - Localized for French, Spanish and Japanese. More coming. - You can now swipe back to dismiss Tweetbot's browser. Feel free to quietly rejoice. In addition to the above changes, the new version of the app includes a setting to force articles in the Safari viewer to open in Reader Mode if the option is available. Tweetbot is absolutely amazing. Twitter developers should download and play with this app, and take some notes for improving their own app. It amazes me how a few guys working on their own can produce an app so far superior to the app Twitter themselves makes, with their dev teams and massive resources. In a sense, the official Twitter app has gone downhill over the years while Tweetbot has gotten better. And of course, rather than improve their own app, they restrict APIs and tokens to make it harder for superior apps to succeed. 4.0.2 adds swipe gesture to dismiss the browser (Safari View Controller) and an option to open in Reader mode. Tweetoot 4 is turning out to be the showcase of iOS 9 and iPhone 6s. I've had TweetBot since Day 1. Best Twitter App and one of the best Apps overall IMO. How did they do that? Why nobody except Tapbots did the swipe back thing for Safari View Controller and the default to reader view? I wonder it 3d touch was an IAP for people who've already paid and paid and paid and paid for this app. They do extensive work on the app and ask to be paid for it, the nerve!! Tweetbot is using stringCode (http://www.stringcode.co.uk/push-pop-modal-sfsafariviewcontroller-hacking-swipe-from-edge-gesture/) trick. 4.0.2 came out just now, fixes a critical bug when using 3D Touch in night mode. I was skeptical of Tweetbot 4 but they fixed pretty much all my issues with save, save for inline GIF support, and Twitter Cards support. Add those and you have an awesome app. So glad to see 3D Touch added. So few apps support it now.